The menus for Location sources are similar. 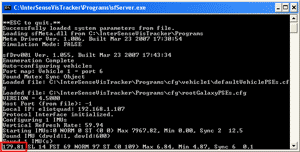 The Intersense and Airtrack are treated as a single data source. To connect to the Intersense/Airtrack, make certain that no other Intersense applications (ISDemo, SFServer, or InertiaCamTest) are running. 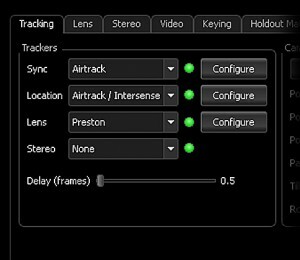 Select Intersense from the Position menu, and wait about 5 seconds. The green light should come on, and the virtual background in the main display window should move. 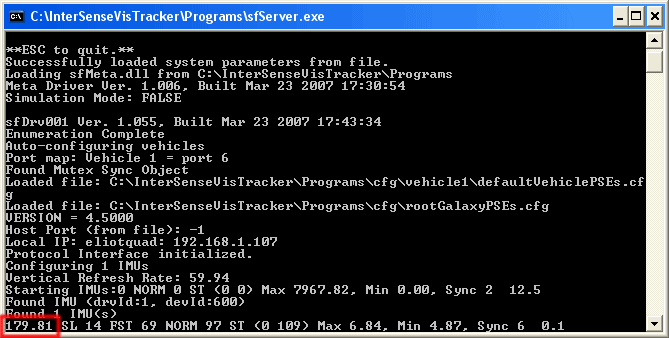 The sfServer window should open when Airtrack/Intersense tracking is selected. The highlighted number at the bottom should be around 180 when running at 29.97 frame rates, and around 140 when running at 23.98 frame rates. Once the background moves, select Intersense in the Rotation drop down selection box, and the virtual background”s rotary motion should be driven by the Intersense. 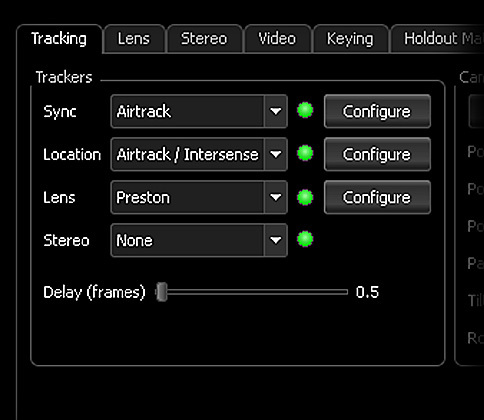 Clicking the Configure button next to the Location drop down menu when Airtrack/Intersense is selected brings up their configuration menu within Previzion. The default orientation of the IS1200 is with the lens facing forwards (in the same direction as the camera lens), and the cable exiting the body from the right. In typical stage tracking applications, the IS1200 will be tilted up at an angle, or pointed directly up at the ceiling. 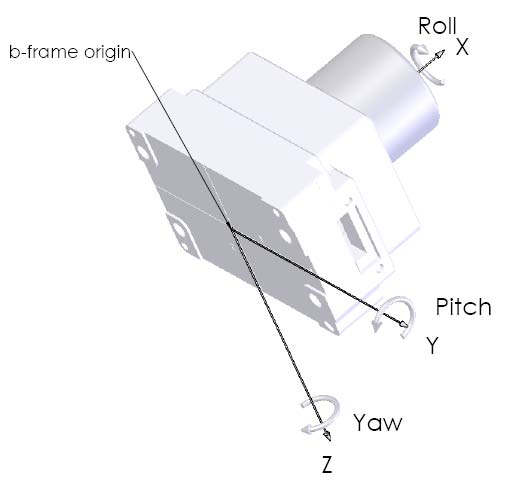 In the Pitch/Tilt value box, enter 90 degrees if the IS1200 will be pointed vertically up from the main camera. The adjustable Intersense mount has 22.5 degree increments, and rotating the mouse scroll wheel will cause the tilt to change in 22.5 degree increments, for fast on-stage correction. For previsualization purposes, it is useful to be able to scale the position data. 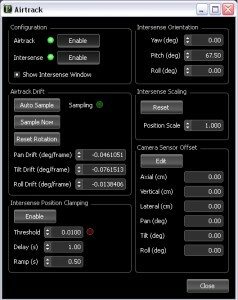 This enables large camera moves to be simulated within a small physical space.